January 19, 2019: at 4:00 pm est today, Mr. Trump seems determined to speak on an immigration compromise allegedly intended to jump start negotiations over the Trump Shutdown now in its 29th day. So far Democrats are said to be unimpressed and he has yet to open his mouth. 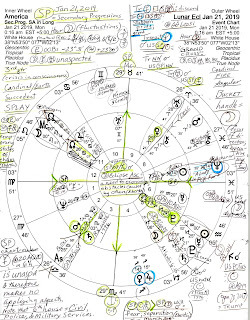 In a chart set up for today at 4:00 pm est White House, there's a problematic Thor's Hammer pattern of Uranus-North-Node (reformers; radical politicians/politics; upsets; restless work conditions) = Venus (diplomacy; values; money--a lady like Speaker Pelosi) which denotes a softening of policies, or the introducing of novel ideas. We'll soon see about that. 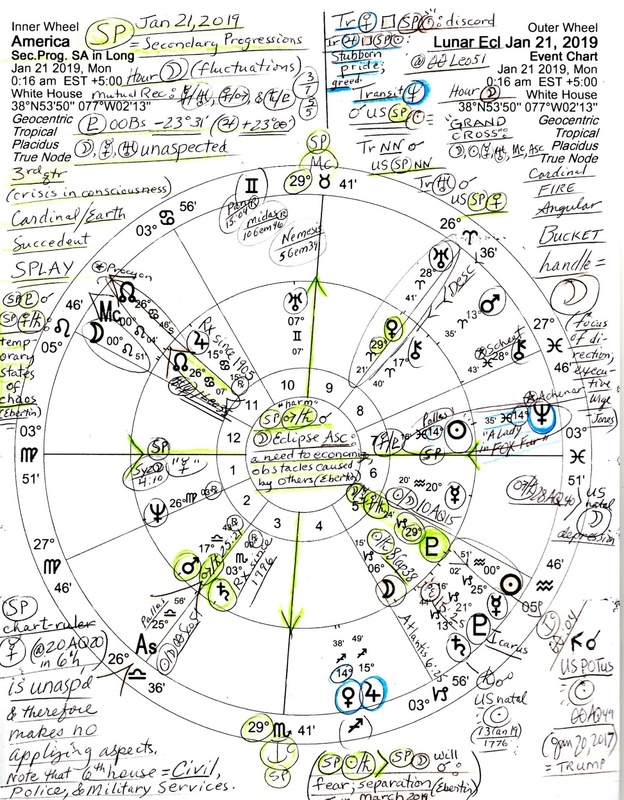 Below is a bi-wheel of my intended post today concerning America's current secondary progressions ('SP') with the January 21, 2019 Lunar Eclipse @00Leo51 which will directly affect America's natal POTUS Sun (the leader; Jan 20, 2017 @00AQ49 = Trump). As you see, transit Neptune @14Pis35 continues veiling, hiding, obfuscating America's POTUS in deceptive Pisces (with a cosmic peep-eye! to FOX News pundits), and as usual, both charts are over-stuffed with details. But hopefully those who are interested can enlarge the image, possibly print it, and manage to read the many notes penned on (you will be rewarded!). No apology for my messiness this time, dear reader, because I was amazed at how instructive this bi-wheel turned out to be...so good luck reading it!